This year’s Super Bowl was supposed to lead into the new Office spinoff with Amy Poehler and Rashida Jones. But the show fell behind schedule: It doesn’t have a name yet, and, in fact, doesn’t even seem to be an Office spinoff anymore. So that post–Super Bowl spot is being filled by a special hour-long episode of The Office, featuring Jessica Alba, Jack Black, and Cloris Leachman. Let’s hope it makes up for this very “blah” 30 minutes. Basically, we take a time-out from the ongoing plot lines. The two stories — Michael and Dwight “spy” on a rival paper company, and the rest of the office has a mock trial to decide whether or not Hilary Swank is “hot” — have nothing to do with each other or anything else that’s happened all season. No references to the Andy-Dwight-Angela triangle, or Pam and Jim’s passive-aggressiveness. It exists outside of Scranton space and time. It’s the definition of filler. Which would have been fine, had it been funnier. 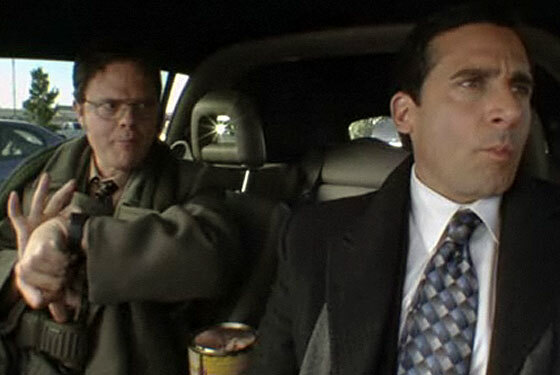 Michael and Dwight’s encounter with Prince Paper — a mom-and-pop that Dunder Mifflin wants to take over — tells us nothing new (Michael’s not evil, but yes, he is spineless). And the Hilary Swank riff sounds like a conversation B.J. Novak (writer of this episode) had with himself at a party and submitted as a backup script. That said, Michael’s reaction to hearing his that Prince Paper rival had started his company after returning from Vietnam — “Oh, I hear it’s just lovely there” — almost made it all worth it. There’s no episode next Thursday, in advance of the Super Bowl. The last time NBC showed the big game was in 1998, when a very special Third Rock From the Sun followed, featuring cameos by Cindy Crawford, Angie Everhart, and Greg Gumbel. Before that, in 1996, came the infamous Friends episode with Brooke Shields, Chris Isaak, Jean-Claude Van Damme, and Julia Roberts. Perhaps The Office will do better.